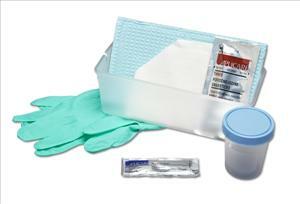 Each kit includes a graduated collection basin, urethral catheter, moisture-proof underpad, fenestrated drape and specimen container with ID label. Also Contains: CSR Wrapped Tray, Vinyl Catheter, 3-pk BZK 2 Dry Swabsticks, Vinyl Gloves. Latex-free..